Johannesburg (South Africa) – Fight Week is here! This Friday, 13 April, EFC AFRICA presents its 13th instalment of incredible mixed martial arts action! The event features 13 massive bouts including the EFC AFRICA welterweight title fight between Dallas Jakobi and Jadyson Costa. 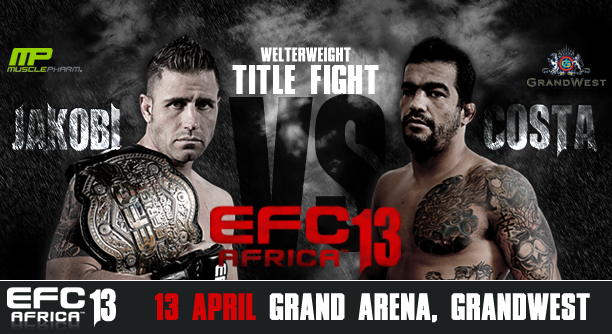 Weigh-in for EFC AFRICA 13 takes place on Thursday 12 April from 2pm in the Market Hall at the GrandWest Casino. Weigh-in is open to the public and free drinks and snacks will be served. Come down to support your favourite athletes and add to the electric atmosphere!